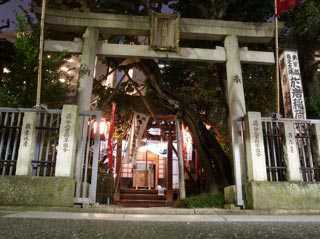 Oiwa-Inari Tamiya Shrine (於岩稲荷田宮神社) is located in Yotsuya, Shinjuku. This shrine is dedicated to Oiwa who appears in the most famous Japanese ghost story "Yotsuya Kaidan." Yosuya Kaidan is a very famous story for Kabuki since Edo Period. People believe there is always a curse of Oiwa when they do that ghost story. To avoid the curse, people visit here and pray for safe acting. Today, "Yotsuya Kaidan" is still the favorite story for all entertainment and people still follow this convention. No parking. No admission fee. Basic story of "Oiwa" in Yotsuya Kaida is very simple. Decent wife Oiwa was murdered by her husband, and she became ghost and revenged him. Many Japanese ghost stories took the idea of this "Oiwa." This story was written in 1727. Oiwa is a real person married into Tamiya family. After several years of marriage, Tamiya Iuzaemon divorced her, and she lost. After missing her, Tamiya familly had a many strange accidents, and they believed it was her curse. In order to quiet down her curse, they built a shrine in their house. Therefore, the shrine is located inside of Tamiya House. However, this story is not based on the true story. Oiwa and Iuzaemon never divorced. After she married into Tamiya, they had a great success of their business, and people got a jealous on them. This story was written for those who wanted to put her down. Therefore, actually, this shrine is good for your business success and family happiness.